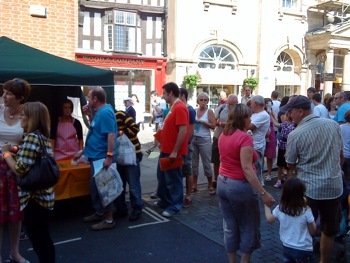 This year’s Ludlow Food Festival managed to top last years both in terms of visitor numbers, the range of different products on show (goat sausages are great) and the quality of the entrants of the Ludlow Sausage Trail. There are 2000 tickets available for the Sausage Trail and these regularly sell out within a few hours of going on sale. Each ticket comes with a voting form and after trying all five sausages on offer the public vote to create a people’s choice. Later, at the Castle, a panel of experts select an Expert’s Choice. This year I was joined by, amongst others, Colin Young of BBC Radio Shropshire fame. Having done a few interviews on the radio with Colin is was nice to put a face to the name and he certainly knew what he liked when it came to the sausages. We were also joined by Andy Richardson of Shropshire Magazine. Andy is a guy who is passionate about local food and really knows what he’s talking about. The quality of the sausages on offer was really high but in the end there could only be one winner. 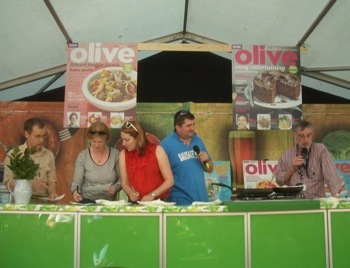 For the results, and to see details of next year’s festival, click here to visit the Food Festival website.